If you are deep in the trenches of life and looking for hope-filled encouragement and practical wisdom, this podcast is for you. With her down-to-earth style, blind author Jennifer Rothschild offers practical encouragement and biblical insight to help you live the "I Can" life of Philippians 4:13 (“I can do all things through Christ who strengthens me"). 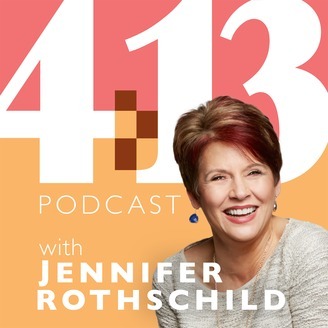 Each episode, Jennifer answers real-life 4:13 questions like, "Can I overcome my fear?" or "Can I find balance?" You won't find just a cheery “Yes you can”—you will hear a confident and compassionate “Yes, you can—and here’s how." You will gain the inspiration and help you need to be and do more than you feel capable of! 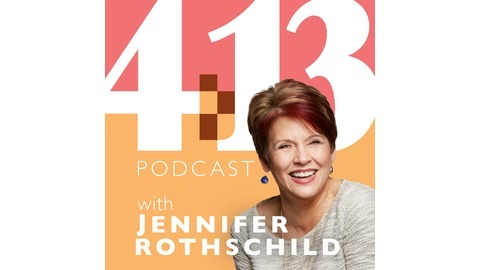 So, if you could use some practical encouragement, join Jennifer and her “Seeing-Eye Guy” KC for the 4:13 Podcast—it’s just 2 friends, 1 topic, and 0 stress. Podcast Website + Show Notes: 413podcast.com. #34: Can I Lay Down Shame and Pick Up Grace Instead? Shame sets you in the center of your thoughts and makes you feel like you’re the only one. Shame scolds you, tries to convince you that who you are is wrong or bad. Shame separates. It isolates you from truth and makes you feel worthless. So, today you’ll hear a big “Shame off you!” You will learn the difference between shame and guilt, analyze if your body is speaking the language of shame, and discover how Jesus' love covers shame. This episode will set you free to drop shame and pick up grace instead! #32: Can I Be On the Right Path When It Feels So Wrong? #30: Can I Handle Criticism Without Crumbling?